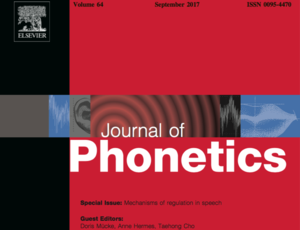 Guest Editors: Doris Mücke, Anne Hermes, Taehong Cho. The special issue is interdisciplinary in nature, bringing together papers from different perspectives, ranging from tutorial and critical review papers on dynamic systems to original research papers on the regulation of speech in both normal and adverse (atypical) conditions. These selected papers, taken together, make considerable advancements in illuminating how variation in production and perception can be seen as a window to linguistic structure within and across languages. You can find the special issue You can find the special issue here.